The Environmental Leadership Awards (ELAs) were created as a way to recognize individuals who have worked alone or with other groups to support UConn’s environmental sustainability efforts on campus and in the community. Nominations are submitted from faculty, staff, and students across the University and are evaluated by a committee appointed by the OEP. Nominees must be affiliated with the University in one of the award categories. Alumni and Special Recognition/External nominees need not currently be working directly with the University provided that their work reflects positively upon the University's reputation. Nominees must have proven dedication and outstanding contributions to at least one of the principles of environmental leadership as outlined UConn’s Environmental Policy statement, which is outlined below. The nominees activities should have taken place in 2019 or 2020. Help ensure environmental compliance or improve environmental responsibility as it relates to the University's operational, research, or other activities. Demonstrate UConn's environmental stewardship and initiative through volunteer efforts and partnerships with surrounding communities or non-profit organizations working on behalf of the environment. Increase UConn's use of environmentally sustainable products, materials and services (including those that are renewable, recycled, recyclable, non-toxic, or energy or resource efficient). "In departments throughout the University, from the College of Agriculture & Natural Resources to Engineering and Liberal Arts, we are developing conscientious thinkers and citizens by modeling the behavior that we teach our students to follow… It is the cumulative effect of seemingly minor events that will change the world. 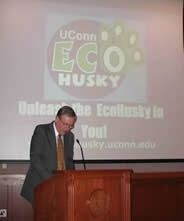 It is through innovative examples and teamwork that UConn can be a steward of the Earth's future." "One year ago today, by adopting our Environmental Policy Statement, the University of Connecticut affirmed its commitment to protect and preserve natural resources. In the following months, many throughout the University community, including all of you, have dedicated time and energy to the principles outlined in our Policy. Today we'd like to recognize your leadership and show our appreciation for all you've done – because the University has truly benefited from your voluntary efforts and personal commitment. "During the past few years, we have improved our environmental performance by implementing best practices and raising environmental awareness. We've begun careful monitoring -- of our air emissions, water usage and life-cycle cost savings, among other things -- in order to compile data, which will provide essential benchmarks for measuring our progress, and will create the appropriate business case for future environmental sustainability initiatives. With our new Sustainable Design Guidelines and our commitment to pursue “green” building and LEED certification, the University has become a beacon of responsible growth, incorporating cutting edge engineering and low-impact design concepts into new construction, like the Burton Family Football Complex and Shenkman Training Center. "As public and private entities throughout Connecticut continue to look to the University for guidance and information, we can now speak to the benefits of sustainability with increasing confidence that we “practice what we preach” here on our campuses. In departments throughout the University, from the College of Agriculture & Natural Resources to Engineering and Liberal Arts, we are developing conscientious thinkers and citizens by modeling the behavior that we teach our students to follow. And students from all departments benefit from the University's environmental vision. Responsibility rubs offs: every time someone uses an Energy Star bulb or an EcoHusky Mug, or recycles or chooses to bike instead of drive, we not only help the planet but implicitly educate our peers. It is the cumulative effect of seemingly minor events that will change the world. It is through innovative examples and teamwork that UConn can be a steward of the Earth's future. "Today we are here to celebrate environmental leadership and teamwork at UConn. 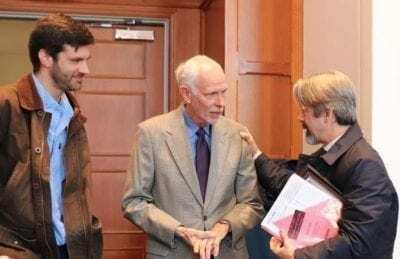 The environmental leadership award recognizes those individuals and groups whose commitment to improvement in practice and design has gone above and beyond their regular roles on campus. Many of these people serve multiple roles as students, teachers, advisors, peers, coworkers and friends. In all their capacities, the University thanks them for the ingenuity and passion that has driven them to create change in our community. To this end, the University of Connecticut and the Environmental Policy Advisory Council are proud to honor the following individuals and teams for their outstanding contribution to the University's environmental vision."